"It will not be effective if catchment areas in the north and south are not reforested. Erosion will still occur and run-off will enter tributaries and eventually silt up the Citarum," said an expert from the Sunda Forestry and Environmental Observation Council (DPKLTS), Sobirin, in Bandung. The West Java provincial administration has continued to dredge the Citarum River in a bid to minimize the impact of flooding in low lying areas of Bandung despite criticism from experts and environmentalists. Project security head Rochendi said dredging activities, which commenced in September last year, had already covered 50 percent of a planned 20-km stretch of the river from Dayeuhkolot to Nanjung. The administration believes dredging the river will be a temporary solution to minimize flooding in the southern part of the city. It has set aside Rp 108 billion (approximately US$12 million), Rp 70 billion of which is from overseas loans, from the provincial budget for the 15-month project. Rochendi said workers could dredge up to 100 trucks full of mud per day from the river. The administration has dredged the river three times since 1986 and has spent hundreds of billions of rupiah doing so. However, experts and ecologists claim the project will not be effective if reforestation is not accelerated in damaged forest areas in northern Bandung. Based on DPKLTS data, catchment areas are currently only able to retain 25 percent of run-off. 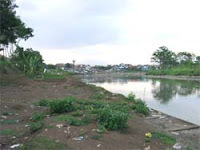 As a result, the Citarum River has to sustain billions of cubic meters of sediment, especially during the rainy season. The level of silt in the river has risen to four meters since it was last dredged in 1994, causing water to overflow during the rainy season and flood low lying areas around Dayeuhkolot and Baleendah, as well as several districts in South Bandung. Sobirin doubts the planned disbursement of Rp 6 trillion for the dredging project by the National Development Planning Board (Bappenas) will resolve the problem. "Let's reforest critical land in northern and southern Bandung. This will be the cheapest, most permanent and beneficial solution," said Sobirin. He said if there was around 200,000 hectares of critical land in the upstream Citarum area and a reforestation fund of Rp 5 million per hectare of damaged land, then only approximately Rp 1 trillion would be required to overcome flooding permanently. At the same time, catchment areas could also be saved. West Java Governor Danny Setiawan said his office would continue with the dredging works and was waiting for the disbursement of funds from Bappenas. He said that the dredging should be combined with the re-greening of approximately 650,000 hectares of damaged forest. "But we cannot dredge and fully restore damaged areas simultaneously. It could take 10 years for the trees to perform according to their proposed function," he said. Setuju om, strategi living with nature tidak bisa dihindari menjadi elemen penting untuk perbaikan lingkungan hidup Bandung Raya.